In 2004 I had a small bunion removed from my big right toe. Now, 14 years later, it is sore, it looks swollen, and slightly dark in that area. I don't know if it has inflammation in that area or what. I had bunion surgery about 7 years ago. I had both my hips replaced without too much trouble. Just recently got bunion pain in the same place that I'd had the bunion removed. Pain for the last 3 days seems to me to be worse than ever even though the bunions have been removed. I suffered from a painful bunion for about 10 years. As it got worse and shoes became harder to find, my walking and exercise decreased. I am thin but heart disease runs wild in my family so keeping mobile is very important to me. I decided to have the surgery because I could barely walk and my quality of life stunk! And I'm only 43! A great doctor performed the surgery. I have pain here and there yes, but if you keep it elevated, ice it and relax for a good week or more, you'll be fine. I'm on day 18 and am beginning to put light pressure on it as I walk but not quite ready to bend it. Crucial to recovery is the wheel cart. For USD 40 a week I rented a knee bike to get me around. It is way better then crutches or walkers which put pressure and stress on other parts of your body that you are not used to. I would do it all over again and if I have to have the other done I won't hesitate! I had bunion surgery 20 years ago on my left foot. I had a prominent large painful bunion. I did not have much choice in nice shoes as the bunion would prevent me from wearing many. I will say it's not for the faint of heart; the pain on recovery was excruciating for at least 5 days. It took me at least two weeks to move around properly. That said it was well worth it. Twenty years later, the foot looks great and no return of bunion. I can wear cute shoes. Do you know, that I don't believe any of the old wives tales of bunions being caused by pointy toed shoes or tight shoes. I am sure my mother, grandmother and probably, great grandmother did not wear pointy toed stilettoes, however we do have a shared history of flat feet and abnormally long second toes. My theory is that, as well as having flat feet that, because there is no arch to stop it, toes are always pushed up against the end of the shoe, and, because the second toe is so long and the soft part of it rests against the big toe, there is no natural traction of a bone, to keep the big toe in alignment. And if women are more prone, it may be because women have to produce cartilage that softens and will yield in cervixes for delivering babes. 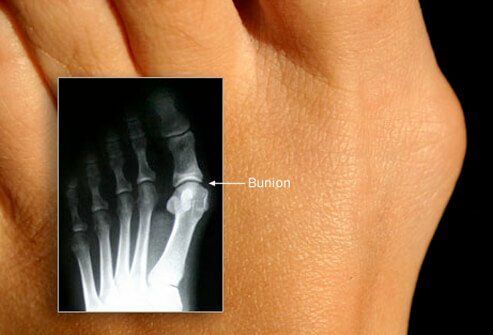 I have had bunions since I was a teenager. My bunions no longer cause pain because I suffer from neuropathy and all of the feeling in my feet is no longer there. My bunions cause ulcers on other parts of my feet. More recently I had to have a toe amputated because I could not feel the sore that developed on my big toe as a result of my bunion. I now have another sore on the other big toe which is caused from the bunion on the other foot. I would rather have my bunion removed than my toe. I do not have poor blood circulation in my extremities but doctors will not do the surgery because I have no pain. I have nerve damage, I can't feel pain. This can't possibly be the only criteria for surgery. I have had bunions for about 10 years. They got worse as I began running more, and started preventing me from running. I used expensive custom cork/foam orthotics for 4 years until I realized that they had allowed my feet to grow weaker instead of stronger. Then I began transitioning to less supportive and wider footwear with less of a built up heel. The reasoning for this was that by slowly introducing less supportive footwear, my feet would grow stronger. The idea with wide shoe is to not smash and irritate the bunions, and the idea with the low heel is to lessen indirect pressure from body weight. I currently treat my bunions by wearing foot shaped, "zero drop" (no heel lift whatsoever) Altra brand running shoes, and sometimes Vibram Five Finger shoes to separate my toes and help to straighten them. The issue is still there, but it doesn't bother me as much as it used to. I'd love to eliminate the issue, but at least it's manageable. I just started noticing bunions, first it was the right foot, now it seems it has gone to the right and the PAIN IS UNBEARABLE. I have been fitted with orthorticcs and a good fitting shoe, I am an avid walker and am frightened that this will affect my way of life. My mom was plagued with the same problems. Bunions are definitely hereditary. I was a teacher for 25 years and suffered with bunions the whole time. Finally, I had surgery on both feet, (a year apart) and I am pain free. The first week of recovery is a little painful, but eases after that. The surgery is well worth it! I am pain free, and my feet look great in sandals! I am 58 and have had bunions on both feet for about 3 years. They are so painful some times that I have difficulty sleeping. I used to do a lot of aerobic dancing but now limit my exercise to walking, weights, and recumbent bike. I do wear inserts in the shoes that they will fit into but the days of heels are gone. I don't want surgery unless I have no other options and I worry about them getting worse as I get older. I don't want to give up my exercise routine for fear of weight gain which would cause other health issues. Not much fun getting older! I am looking into having Bunion Surgery. I'm not sure if that is going to take care of my feet problems. My concern is that my bunions are not the only part of by feet that hurt. I had surgery in September for plantar fibroma and that went well. Now I am still having problems with that foot not with the fibromatosis but plantar fascia on both feet get tight hurt a lot when on my feet. The one foot that had surgery on hurting the worst.